In medicine, Brody and Waters stated it quite clearly in the title of an article they published in the Journal of Family Practice: Diagnosis Is Treatment. Effective teaching is perhaps similar. Being able to identify the needs of a learner should equip a teacher with a starting point. Where a learner currently stands should likewise inform the teacher what is necessary thereby allowing for the appropriate and correct strategy or intervention to be drawn. Initial assessment is important to assign adequate resources and design appropriate teaching plans. If the answer is "yes" to the above question, an English proficiency exam is often administered. There is not one exam used and schools can choose from a wide set of tests. How the performance in such an exam is translated to proficiency in English is likewise oftentimes up to the school or district. Thus, there is an apparent wide variation in how English-language learners are assessed across the country. The 32-year old mother who went through school being labeled as an "English learner" does not want the same thing to happen to her daughter. 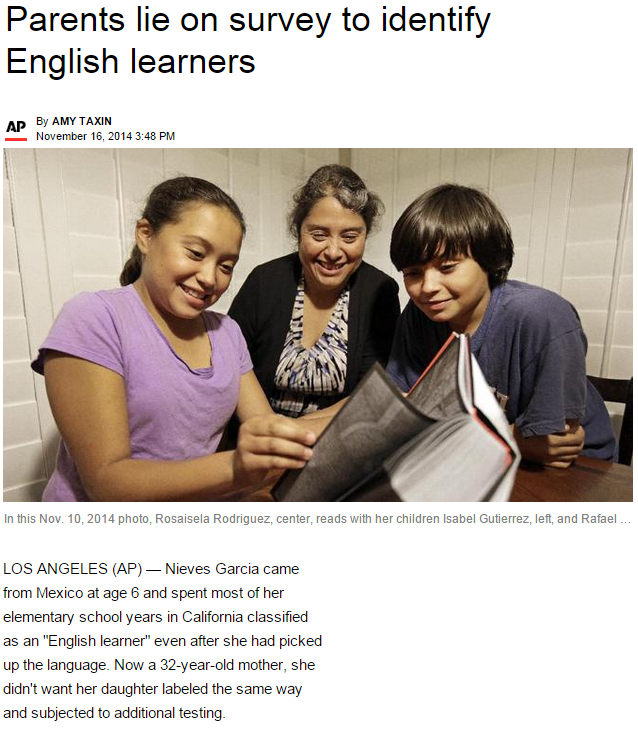 "...Parents like Garcia fear that by acknowledging the truth, their kids will be siphoned off from native English speakers or stigmatized, and could miss out on learning opportunities...."
The consequences of the label can likewise, as one can imagine, vary from school to school, and from state to state. As a student progresses, he or she can be reclassified. A student who now demonstrates proficiency in English loses the "English-language learner" label. In California, a longitudinal study is available that relates education outcomes to language learner classification. 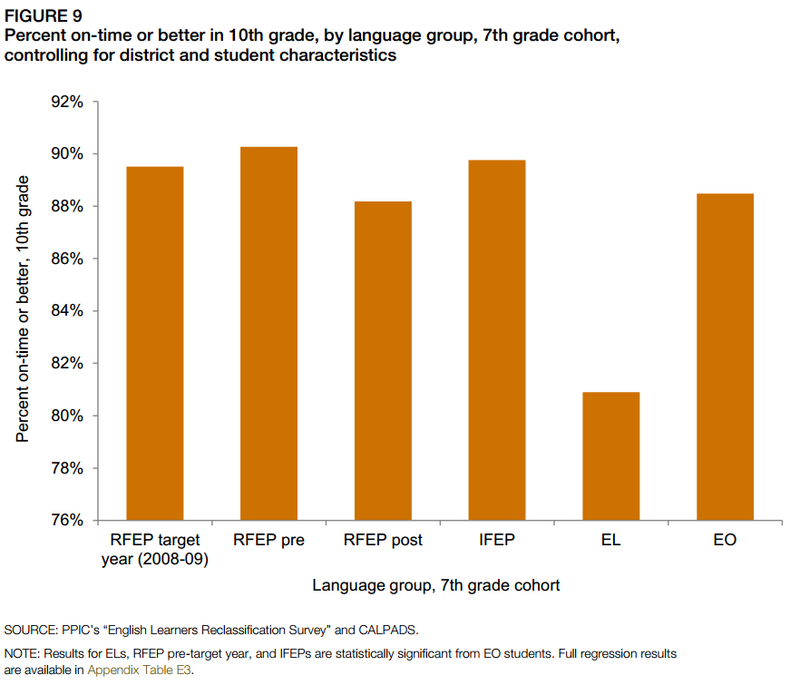 In the following figure copied from this study, RFEP corresponds to Reclassified Fluent English Proficient. The modal time for this reclassification is at 4th grade so "target" includes students who have been considered proficient in English right at 4th grade, while "pre" corresponds to students who have been reclassified quite early (2nd grade - 3rd grade), and "post" are those who have been reclassified after fourth grade. IFEP are children who said "yes" to the initial survey question (“Is a language other than English spoken in your home?”), but are deemed English-proficient at the beginning of school after testing. EL are those students who have never been reclassified while EO are students who said "no" to the initial survey question. How Much Do We Really Know About Education? Teachers' Sit-Down Strike in the Philippines? When Should We Begin Developing Grit? Why Do People Believe in "Learning Styles"? How Should Teachers Teach Math? When Should a Child Start Schooling?